Welcome to another Seasonal Recipe Round-Up! This time we're featuring rhubarb (and next time is asparagus — see schedule below). I'm sharing my tips and two recipes, and you can participate by sharing your own tips and/or recipes in the comments. 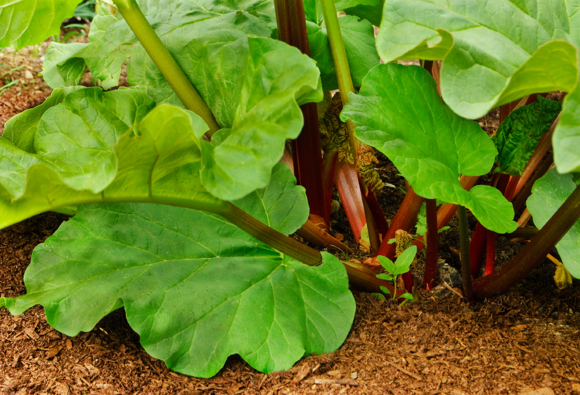 Rhubarb is a perennial plant with crisp, celery-like stalks and large triangular-shaped leaves. The leaves are toxic, but the stalks may be eaten or used medicinally. It is mostly water and does not boast high nutrients — except for Vitamin C and calcium. Being so tart, rhubarb stalks are usually stewed and sweetened and often combined with other fruits to make jams, pies, cobblers, pickles, relishes, and chutneys. In my book, The Complete Idiot's Guide to Fermenting Foods, you'll see a rhubarb soda as well as a rhubarb chutney. Also, Shannon from Nourishing Days created a delicious-looking lacto-fermented rhubarb chutney — I've wanted to try it since I saw it last year. I take a knife and gently peel off of the outer, stringy layer before using it in dishes. But you don't have to do that. It can be stewed in big chunks or in small dices. Just a few minutes of stewing and it will fall apart easily. Do not eat rhubarb leaves! They contain high, poisonous levels of oxalates. More information is here. Cut off leaves and trim stalk ends. Wash the stalks and pat dry. Cut into your preferred size pieces for storage. Store in airtight containers in the refrigerator for a couple of weeks. Freeze for longer term. In today's Seasonal Recipe Round-Up, I'm sharing two GAPS-friendly, honey-sweetened, nourishing recipes to help you use up your abundant rhubarb — a tart rhubarb jam and moist rhubarb-walnut muffins. 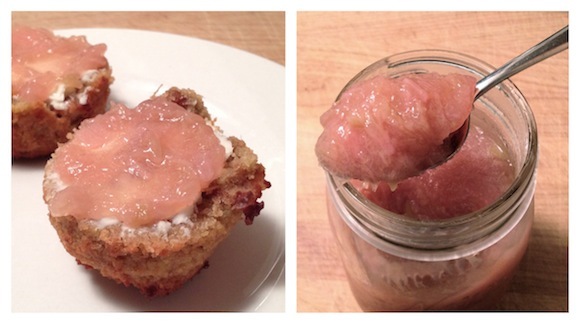 Click here to view these recipes: Rhubarb Jam and Rhubarb-Walnut Muffins. Now, it is your turn to share! Bloggers and non-bloggers, feel free to add a comment here with your favorite recipes or posts. Please use real, whole ingredients in recipes, and preferably traditional methods of preparation. Whole ingredients means whole grains, vegetables, legumes, meats, and unrefined sweeteners. In order to keep the integrity of “nourishing” food, I will delete any recipes that use processed, boxed foods. Where possible, incorporate traditional methods of preparation, like soaking, sprouting and fermenting. The idea here is that your recipes and tips should help our readers find traditional methods for preparing seasonal vegetables. Share Your Rhubarb Recipes and Tips! 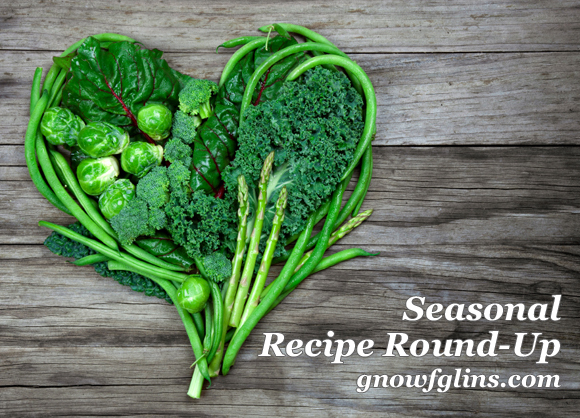 All seasonal recipe round-ups are (and will be) listed on the Recipes page. Come back on Friday, June 8 for our asparagus link-up in the Seasonal Recipe Round-Up. Just got rhubarb from my co-op – can’t wait to get some good recipe ideas! Wardee – Thanks for hosting, I’ve shared a recipe for rhubarbade that can be sweetened with sugar or stevia. My mother would make rhubarb sauce and we would have it over vanilla ice cream. YUM! I love rhubarb. Just yesterday I made rhubarb syrup for a Farm Girl Cosmopolitan. I haven’t blogged about it yet but it was super tasty! Oh my gosh!!! I made a dessert from The Whole Food Revelation from rhubarb. I think it was Sweet Almond and Sprouted Spelt Tart with Roasted Rhubarb Jam. It is soooooooo good!!! I did change the recipe just a slight bit. I added about 2 cups more of rhubarb than what the recipe called for. I used Evaporated Cane Sugar as I didn’t have coconut sugar (crust). (I haven’t seen that at any store yet.) I also couldn’t find Orange Brandy so I flavored my yogurt with almond extract. While I roasted my rhubarb and baked my shell I drained (in a hanging bag) my just like store bought yogurt (Katie’s recipe). In total I drained a quart of yogurt for 1 hour. This made a nice size dish, I used my round stone baking dish from Pampered Chef. Looks pretty and just the right size for the recipe. One of my readers told me about this cool round up. I posted several rhubarb recipes. I adore spring rhubarb. What a wonderful way to share rhubarb recipes! I have so much rhubarb this year, I’ve made a fantastic barbecue sauce and two different chutneys. I’m posting the other chutney on Thursday so I’ll be back to share! Hi Wardee- I’ve been cooking and baking with rhubarb so much lately and I love it!! Quick question.. I got a bunch yesterday in my farm share and it’s green. Do you know if it needs to turn red to be “ripe” and should I store it in the refrigerator right now or leave it out? I appreciate any advice you could offer. Last time someone gave me green rhubarb, I left it out and it wilted so I am assuming I should refrigerate it..